As head of RBC Capital Markets, McGregor spent a decade expanding a Canadian bank-owned firm once focused on its home turf into a global operation with more bankers, resources and revenue in the U.S. and a growing beachhead in Europe. McGregor, 62, is looking for an edge going into the new year. Industry estimates suggest private-equity firms have more than US$1 trillion of undeployed capital — so-called “dry powder” — ready to be spent. McGregor wants RBC Capital Markets to play a bigger role in providing banking services to those firms, including Blackstone Group LP (BX.N), Brookfield Asset Management Inc. (BAMa.TO), Apollo Global Management LLC (APO.N) and Silver Lake Management LLC . McGregor has pursued the same strategy for more than five years: building the investment bank with on-the-ground operations in its geographic focus areas — Canada, the U.S., U.K. and Western Europe and, to a lesser extent, Australia — with lending, advice and sales-and-trading capabilities. RBC Capital Markets has about 7,500 people worldwide, with about 3,000 each in Canada and the U.S. Still, the business continues to evolve and 2018 was marked by reshuffling within its operations. The firm elevated a new generation of bankers into key leadership roles amid departures of some long-time managers. Derek Neldner became head global investment banking out of Toronto, while Jim Wolfe and Matthew Stopnik were picked to jointly run the U.S. investment bank from New York, replacing Blair Fleming. McGregor has kept growth within Royal Bank’s (RY.TO) overall goal of having capital markets represent no more than 25 per cent of total earnings. RBC Capital Markets had $8.4 billion of revenue in the last fiscal year, helping lift annual earnings 10 per cent to a record $2.78 billion — representing 22 per cent of Royal Bank’s total profit for the year ended Oct. 31, according to financial disclosures. A decade earlier, RBC Capital Markets had annual earnings of $1.17 billion and revenue of $3.94 billion. 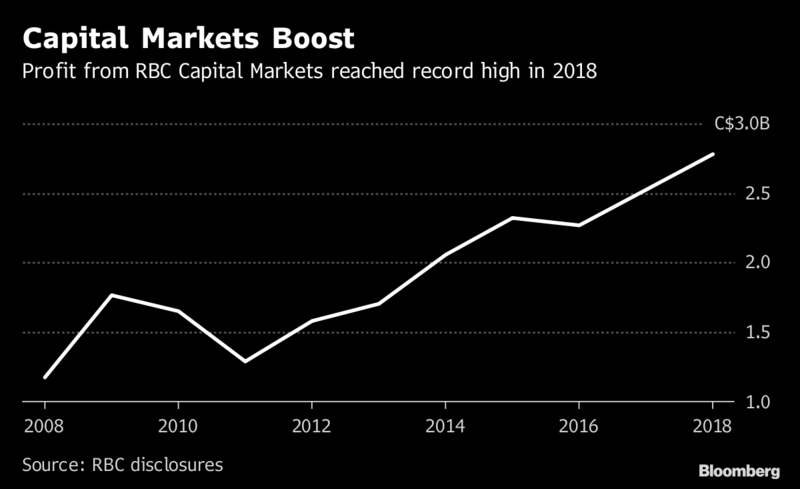 RBC Capital Markets has had growth spurts in times of turmoil — its big U.S. push happened during the financial crisis, when RBC picked up top talent as other firms retrenched. After the financial crisis, RBC ramped up corporate lending more rapidly than its competitors, gaining more clients and giving it a chance to gain their investment-banking mandates. Today, RBC has half its loan book in the U.S.
McGregor’s been exporting the U.S. growth strategy to the U.K. and Europe in the past five years, with a greater push on investment banking and corporate lending to diversify beyond its fixed-income sales and trading business that was long the firm’s mainstay business in Europe. The bank now has 250 investment bankers in Europe, up from 70, among the 800 staff in the region. RBC expanded in continental Europe as well, with a build-out in Paris and Frankfurt that started four years ago. Revenue between the U.K. and Continental Europe is now evenly split. RBC is adding more bankers to the Frankfurt office, after getting approval to be a regulated dealer, which permits investment-banking functions. RBC is incorporating a branch in Paris, which will be used to extend corporate lending. The Europe presence also provides a defense for Brexit. Geographic diversification has helped RBC weather downturns closer to home, including the latest malaise affecting mining, energy and commodities prices that have hurt Canada’s resource-dominated economy.